Perfect is PERFECT, says the LORD. I will give you perfect peace, as you trust in Me. I will give you perfect rest as you believe in Me and My infallible Word, at all times. I will give you perfect comfort and perfect joy, as you enter into My presence, and have fellowship with Me. I have perfect times and seasons that I have ordained for your life, and I will give you perfect love that will cast out all of your fears, says the LORD. For I will silence your fears as you trust MY perfect will for your life and the lives of those you love, says the LORD. For your rest will be complete in Me, only as you entrust everything into My care. 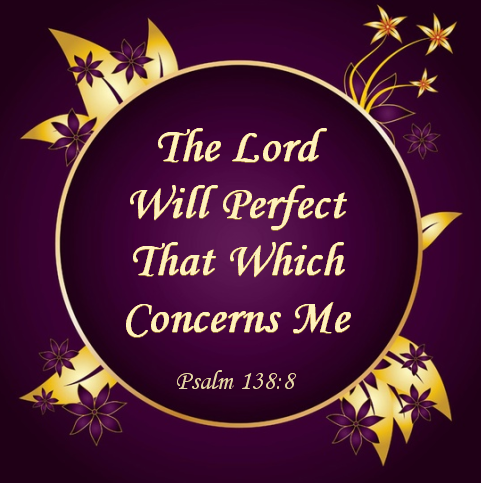 My perfect Word and perfect Work will be performed, and I will, yes, I will perfect everything that concerns you, as you embrace the promises that I have given you, with unspeakable joy, says the LORD. THANK YOU MY FAITHFUL FATHER GOD, SO SHALL IT BE UNTO ME, IN JESUS NAME, AMEN AND AMEN! Amen I receive it thank YOU JESUS!